Offer Terms: Minimum qualifying deposit is £10, maximum is £50. First deposit only. Bonus available to use on bingo only & expires after 42 days if not used in its entirety. Carries 2x wagering. Free Spins via email within 48 hours, available for 7 days. No wagering requirements or cap. Bingocams launched back in 2011, and are still one of only 2 platforms offering a complete twist to online bingo. Bingocams was created with an innovative idea to combine the world of online gaming and also the experience of playing in live bingo halls, by designing a fantastic site including the use of live webcams. Each individual player has the option to turn on their own personal webcam in order to see and by seen by other fellow Bingocam roomies. This offers a really unique and personal experience throughout, and enables players to take the chat room feature of most sites to a whole other level! Since its launch, the platform has seen a dramatic rise in its popularity, and the bingo community seem really happy and safe playing here due to its brilliant terms and conditions and well monitored chat environment. There are many rules set out which may seem overwheleming at first, but this is just to ensure a safe bingo experience for all players. You can choose whether to partake in all of the webcam experiences including group chats and private ones, so if you do decide to use the feature you’ll be completely in control of who sees your content. The site as a whole can seem slightly manic at first as there are several menu options, guidelines, events, calenders and promotion pages to keep up to date with. It is well designed and it does feel very professional however, but due to nature of the unique style of the site, it does take a bit of getting used to if you’re a newbie to Bingocams. Once you’re familiar with all the features and menus though, you will not be dissapointed with what the site has to offer. The bingo on offer is fairly simple, and mostly comes in variants of 75 and 90-ball games. There are several rooms across the site, and each one offers something slightly different from day to day. There’s a fantastic events calender tab found on the homepage, with detailed info on up and coming exciting games. You will have the option to choose your webcam features for each game played, and you can play and chat away then till your heart’s content! Games can cost as little as a penny, and there is also up to 12 hours of free bingo a day for funded players too! You will also find over 500 slots and additional casino and table games across the site aswell, with options for Live Bacarrat, Roulette and Blackjack each day. All new players can enjoy a 300% welcome bonus too, with 25 free spins on the brilliant Starburst slot. The team at Bingocams pride themselves on offering unique, generous and fair bonuses, which give great value to all their players! All new players can enjoy a great welcome offer and details of which can be found via the link above at the top of this page. All players must be aged 18 or over, and terms and conditions will apply. Other promotions and bonuses come in the form of daily events and also monthly and seasonal specials. They all offer a huge variety of rewards and treats, including cash bonuses and also physical prizes such as amazing exotic getaways. Current events include The Last Man Standing, where there is up to £2500 to be won in free tournaments, and the Penny Arcade where tickets cost just 1p a game. You can also find the Coffee Morning Jackpot room where there are 10 jackpots of £20 every day from 10am GMT. There is also an amazing loyalty scheme in place at Bingocams where all players are rewarded with status points for every game you win. The more you play, the more likely you are to win and as you climb the Bronze, Silver, Gold and VIP levels, you’ll gain amazing loyalty prizes and player status as time goes on. Another great feature at Bingocams is the fabulous 2 progressive jackpots on offer. The Big Bang jackpot starts at £1000 then just keeps on growing, and then there are individual room jackpots too! The Bingbling jackpot currently stands at over £800. The Bingocams site runs on the B-Live Gaming software, and the is operated by Dazzletag Entertainment Ltd in Malta. The company are licensed and regulated by the Gambling Commission of Great Britain. 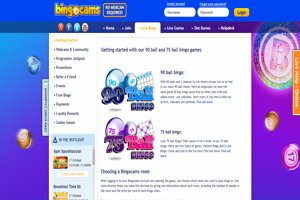 Bingocams offers up two different types of bingo game, those being the popular 75 and 90-ball variants. You’ll find a great variety of rooms offering different ticket prices, jackpots, prizes and chat games, and all rooms have a really exciting live feel to them with the exclusive webcam feature. This personal bingo experience offers players the closest feel to a real live Bingo hall, and is favoured by bingo fans greatly. Free bingo is available for all players who have deposited in the last 24 hours too. You’ll find 12 hours a day of free games in the free Lounge every day between Midday and Midnight GMT, and there are real cash prizes starting at £50. 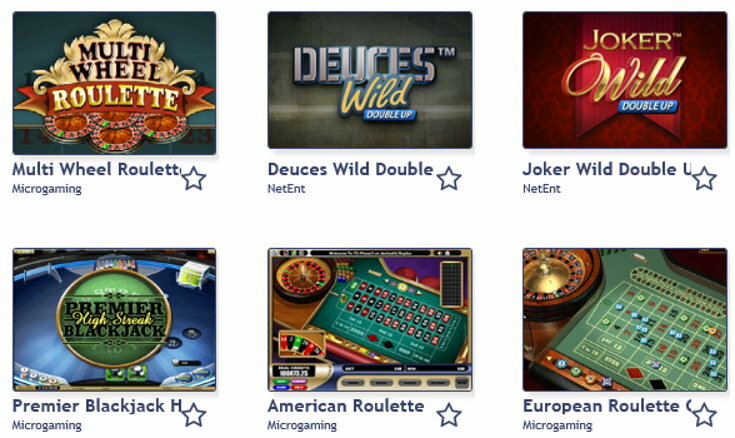 As well as offering awesome bingo games, this platform also offers its players Live Casino options including Live Roulette and Live Blackjack, alongside hundreds of other table games and slots choices too. There are way over 400 slots to choose from including popular titles such as Mermaids Millions, Twin Spin, Spring Break and Game Of Thrones. Please read all terms and wagering requirements upon registration, as details are always subject to change. Bingo and games wagers can differ depending on individual bonuses. Bingocams offers a really exciting and novel way of playing bingo. Although the variants on offer aren’t huge, it’s more about the interactive and friendly live experience overall. The webcam feature offers a really personal way of making friends who share a similar interest to you, and the fact that you can play without the webcams too, means you can vary your gaming depending on how you feel each day. There is a fantastic variety of additional gaming available too, and the guaranteed and progressive jackpots on all games are of a really high standard of payouts. The values and ethics of the site are very customer focussed, so you should feel very safe when playing in the Bingocams team’s hands.